Champagne Jacquesson is located in the town of Dizy north of Epernay. It is operated by the Chiquet brothers who craft terroir driven Champagnes and chose to express the vintage rather than craft a consistent house style. Their Champagnes have close to zero dosage and they are known for their late disgorged cuvées. Their vineyards are farmed pretty much organically and are all located in premier Cru and Grand Cru sites. 80% of the grapes that go into Jacquesson wines are from their own domaine, so they purchase just 20% from nearby growers to make their cuvées. These are seriously complex Champagnes that emphasise minerality, depth of fruit and have great ageing capacity. With the 2000 vintage, Jacquesson released a numbered, vintage-based cuvée (the first being ‘728’) and since that time, each year, a new-subsequently numbered-cuvée is released, hence Cuvée No. 740 is based on the 2012 harvest with about 20% reserve wines from past vintages. The assemblage of each numbered cuvée changes from year to year. Chardonnay makes up around half of the blend, followed by around one quarter each of Pinot Noir and Pinot Meunier. The winemaking is traditional; with vinification in large old oak barrels, on the lees, with weekly bâtonnage, minimal dosage and no filtration. Jacquesson’s reputation is ironclad and usually mentioned in the same breath as producers like Krug and Selosse. 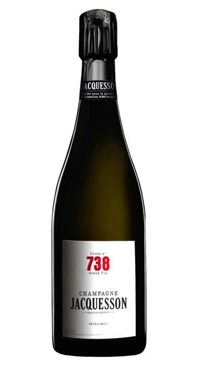 Their 700 series offers some of the best value for money in the region; the cuvée 740 is based on the stellar 2012 vintage. Notes of citrus and white flowers emerge from an ultra crisp, intense palate. It greatly improved my Tuesday and I know it will improve any day of your week!